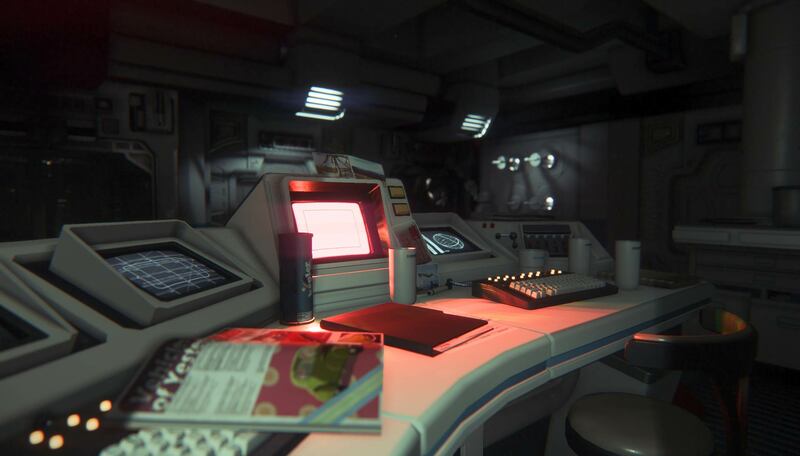 We have all been burned by past Alien games and I would like us to maintain a healthy scepticism about Creative Assembly’s recently unveiled Alien: Isolation, which I went to see and play just before the turn of the year. With this in mind, I believe it an obligation, before we begin discussing this new threat, to observe a moment of silence in which we can all remember the brave souls we lost to the Colonial Marines disaster. The good news is that, despite keeping that scepticism intact, my recent hands-on with Isolation has given me cause for hope. 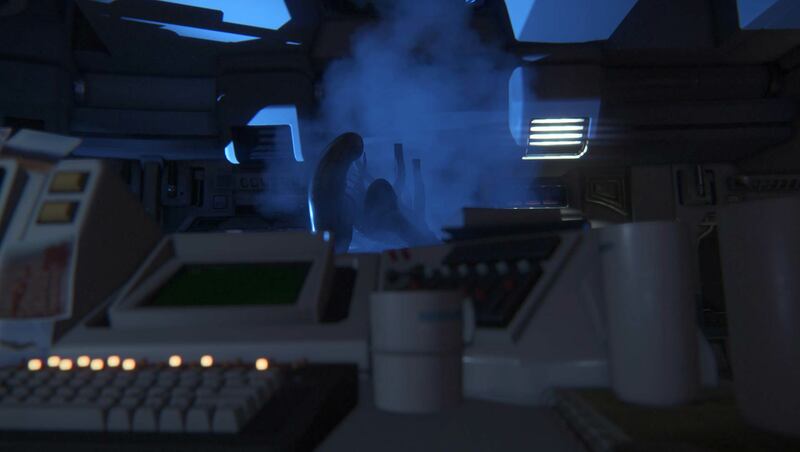 With luck (and no small amount of effort from the development team) we are a little closer to having an Alien game that actually captures the feel of the original movie. Note – click on any of these screenshots for a big ol’ high res version. Take a watch of this announcement trailer before you carry on reading, and then I can flesh out some of what you’ve just seen. 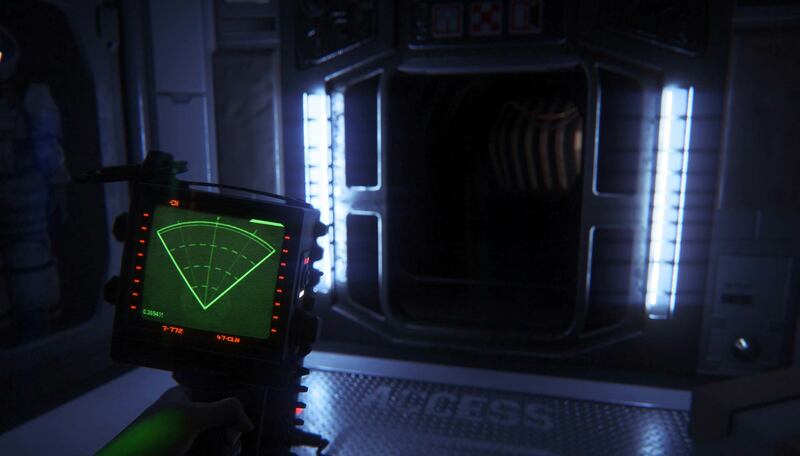 Described as a single-player survival horror, Isolation puts you in the role of Amanda Ripley, daughter of the movies’ Ellen. She is investigating a space station with a team of Weyland-Yutani hirelings on a mission to find the black box recorder from the Nostromo (the spaceship in the original film). Obviously, something has gone wrong (a wild Xenomorph appeared!). Creative Assembly is keen to avoid the moniker ‘FPS’ – Amanda is an engineer, not a soldier. To reinforce that, not one of my brief 20 minutes spent tip-toeing through a jeopardised space station featured guns, bazookas, turrets, grenades OR superweapons capable of unimaginable, unknowable destruction. The only thing I had was a motion detector. This clunky old reminder of what made the cinema space horror so intense was pretty much the star of the show for me. The Alien itself has been modelled and animated very well, complete with horrible Nosferatu creep-walk and saliva waterfall. However, not only is the analogue 1970s motion detector faithfully reproduced, it also appears to be the keystone of the entire game’s design. You potter about trying to get from corridor to computer to control levers to airlock, all the while keeping watch for the double-mouthed monster. Early on in the demo I heard a beep to my left and spun around only to discover nothing – but soon afterwards there came a beeping spot ahead of me. It came on but I saw nothing ahead. It neared and neared along with the sound of the tracker (bleep… bleep bleep… bleep bleep bleep…BLEEPBLEEPBLEEPBLEEPBLEEP). Was the thing in the ceiling? The floor? The walls?? There was nothing I could do but leg it back down a steely corridor and lie still behind some boxes. Eventually the beeps disappeared and I worked up the courage to carry on. The game had succeeded in reproducing an iconic scene from the movies – and I had not even seen the beast yet. “We are trying to recapture the Alien,” he says of the creature itself, citing the small dog-like animals the thing has become in recent incarnations. “We want to – and this is sort of a clunky phrase – but we want to re-Alien the Alien.” To this end, when the Alien finally does appear, it slithers from the ventilation above like a huge 9 ft eel. (Fun fact: the Moray eel was discovered to house a second set of jaws within its throat in 2006, just like the Alien. This means that H. R. Giger, working in the 1970s, came up with a biological feeding mechanism completely independently of evolution, perhaps proving that ‘Intelligent Design’ is a valid theory but also, paradoxically, a totally human enterprise). Anyway, when the alien finally slithered down in my play through, the feeling of threat was immediate. It was big and lithe. I hid behind boxes, under a table, round corners. There were lockers dotted around too that you can slip into but I didn’t find one in time. Part of the tension of this hide-and-seek comes from all the subtle gamey things that CA have intelligently included. 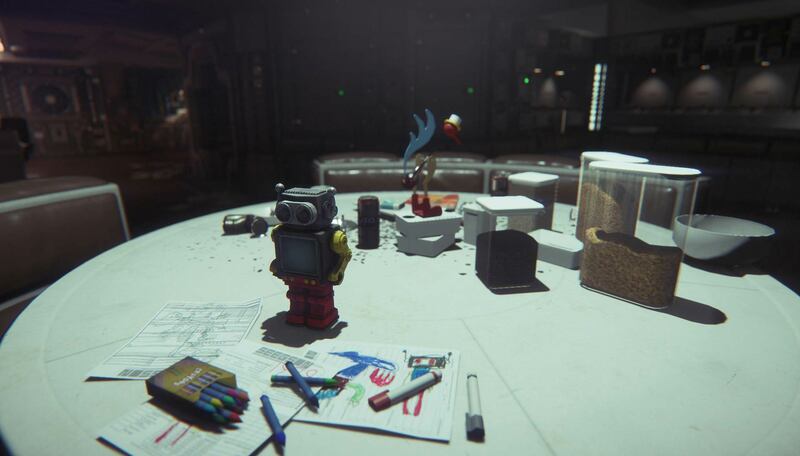 You can lean around corners and over the top of boxes and consoles – but I am told if you do decide to have a quick peep, the Alien can spot you if he is looking your way. None of the baffling disconnect from Dishonoured’s idiot guardsmen here Just the fearful dilemma: look or hide. It’s simple and it’s smart. Once again the tracker deserves a mention. Fans of Metro: First Light’s dedicated ‘wipe visor’ button may appreciate Isolation’s gambit. When you are holding the motion tracker, your eyesight of everything else is slightly blurred, out of focus. To refocus your eyes on the room in front of you, you must hold another button down – so you are constantly swapping your focus from your bleepy lifeline to the environment around you. It is such an unnerving and understated touch, yet so obviously sharp-witted, I’m struggling to remember where it has been done before (it must have been! Help me out here commenters). In restraining even the speed and power of your eyesight, the design team have made the clever decision to ever-so-slightly disempower your character – a design tenet that too many games ignore, even those within the survival horror genre. I jest. However, a Kotaku report from October did suggest that other weapons will be on hand, and that other baddies will pop up. I didn’t see any of that and the devs were being very coy about latter sections. I am sorry I could not wrench it out of them. In my journalistic duty, I have failed. What I can tell is that the film has been fairly effectively channelled. In terms of environmental art, the space station is designed with the archaic tone of untidy 1970s sci-fi. One of the artists says he deliberately recorded video footage onto a VHS cassette, then re-introduced it to the game with all the blemishes and snowy flickers that the obsolete technology could muster (he even went so far as to use a copy of Alien, possibly for ceremonial purposes). Likewise, much effort has been made to make the music and sound effects feel right. The team rooted out a reel of tape from Fox’s archival vault in California which contained all the horrible whale-like noises of space hidden in the original film. And to hear the sound designers talk of the original score, they could not be more loyal to the license if they lay down next to Jerry Goldsmith’s grave and starved to death because they did not leave. While these stories are the kind of thing that every journo like myself is spoon fed during a studio visit, they still suggest that the team is going for as authentic a tone as they can. Certainly what I have seen, though incredibly brief, is enough to make me nod sagely in approval. How long the game will commit to the Amnesia-like mechanics before it begins to introduce other angles will determine the ultimate taste of the horror. 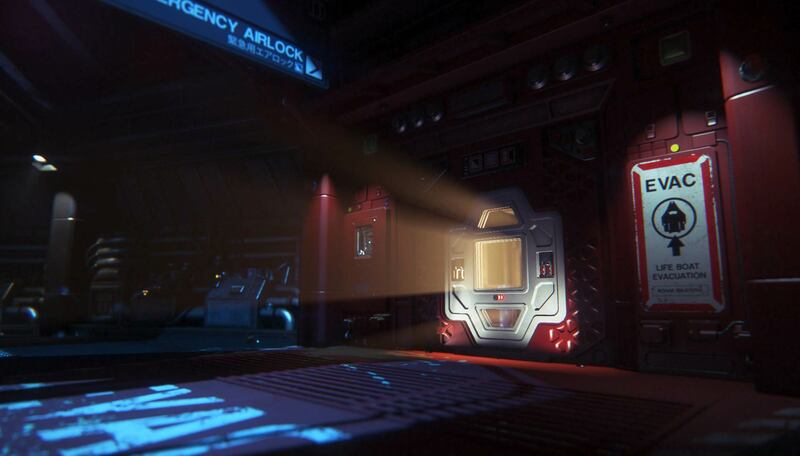 I am told that the Alien’s appearance will be “low frequency, high impact.” What other challenges the player will be facing in the meantime remains to be seen. Though I would bet my fresh cotton socks it will include androids, computers, other human badfolk and all the other corporate shenanigans of the Weyland-Yutani group. If these take the form of numerous henchmen the suspenseful tone may be compromised – perhaps not entirely, but somewhat. Like I say, success at being the Alien game that everyone wants depends entirely on commitment to this atmosphere – but also on restraint. A weapon or item that can harm the alien or other enemies (should they appear) might be fine, so long as it is incredibly rare. Again, the dev team seems on track here. I was told that testers were given a gun in some early trials but as soon as they saw the Alien, every one of them decided against using it. “They took one look and thought, ‘no, this is only going to piss it off.’” At the same time the hide-and-seek elements might get exhausting if it is all you are expected to do, or if the game drags on for too long. During the demo there was a computer hacking minigame and some scrap collecting but not much else was being given away to me. (The computer hacking minigame is a simple and neat job of twiddling knobs to get a signal and matching some shapes together – but again the device is straight out of the movie and its interface, all chewy-tough push-buttons, felt perfectly intuitive). If the story and character chatter can hold it all together, there might not even be need for much more and this will partly be down to how well Dan Abnett, the comics writer and novelist, has envisioned the tale – but my instincts tell me the crafting system is going to be a vital cog in the game’s mechanical underbelly. Now. I have said a lot about being wary and we should certainly keep our cool. But I would like to say one final thing in (expectant) favour of Isolation. At least as much as Amnesia, anyway. This may be down to the horrifying military briefing the dev gave me before going into the game. Or it may be the fact that the Xenomorphs have always been a favourite fear of mine, inhabiting my childhood nightmares ever since Papa Caldwell made the smirking (tipsy?) decision to let his boys sit up late with him to watch his favourite sci-fi movie, long before they should have been allowed. Consider that my admission of bias, and the reason why I will give this new horror the benefit of the doubt, despite what has been done to fans in the past. For the short twenty minutes that I was locked in that room with the Xenomorph – that hulking, slavering three-metre tall monster – I was twenty times more engaged than at any point during my sorry hours spent blasting faceless dudes in Colonial Marines. At one point I took a gamble and legged it toward an airlock to escape. 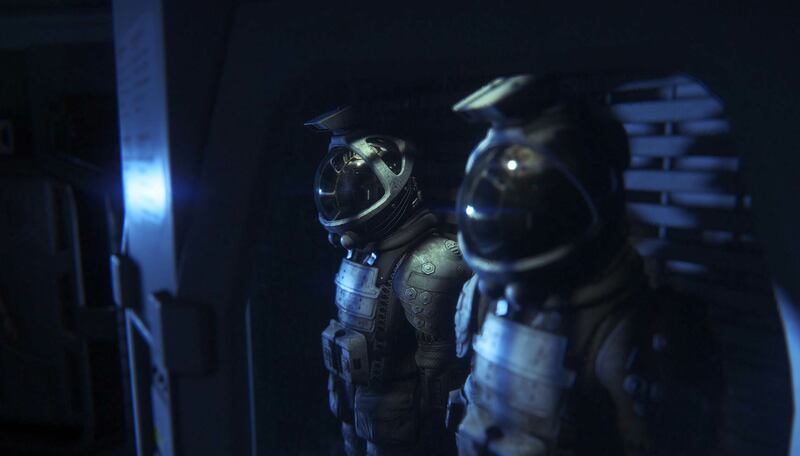 I heard the alien screech behind me, reached the door and… The airlock closed. Something exploded in the station – some malfunction – and sent the whole place spinning. All scripted, of course, but I still got up and thought to myself, “Ahhh, I am still trapped in here with IT.” I couldn’t see it. I couldn’t hear it. But I knew it was there. So I hid behind some boxes and got my motion tracker out. When the demo was over I had an interview (which will follow shortly). I asked the on-looking developer, Al Hope, what I did differently to other players. I’m taking that as a good sign. But stay frosty. Never forget.